On the blog, I’m planning to introduce plenty of manga that Japanese learners may be interested in reading. The recommendations I make will usually be based on the difficulty of Japanese used, or the fact that it offers an interesting insight into Japanese culture. Generally, manga is best tackled when you reach about JLPT N3, although this can vary depending on the genre. Today I would like to introduce Cooking Papa (クッキングパパ), a long-running manga series created by Tochi Ueyama. The main character is Kazumi Araiwa, a senior member of staff at a food business. At work he manages to strike a balance between getting work done and caring about the well-being of his colleagues, but what really catches his boss Higashiyama’s eye is his delicious homemade lunches, or bento (弁当)! It turns out Kazumi’s wife is busy working as a journalist and is a terrible cook, so Kazumi is responsible for making his own bento. The manga spends a lot of time focusing on how Kazumi makes a series of amazing meals and lunches to treat his coworkers and family. Each volume contains a number of real-life recipes with hints and tips on how to bring out the best flavors. For example, the recipe for おにぎらず (Onigirazu, a kind of rice sandwich), has recently become a lunchtime favorite and there are plenty of videos on how to make it for yourself. This dish was first popularised in Japan after being published in Cooking Papa. Handy recipes aside, I like how the manga has Kazumi (and his wife) somewhat breaking traditional gender stereotypes, whilst keeping a fun and lighthearted tone. In addition, whilst there are over 130 volumes, each volume is episodic so you do not need to start from volume one. This also makes it a good choice for shorter reading sessions. I would probably recommend this to someone about JLPT N3 or intermediate level. Having a fair bit of dialogue, it helps to be familiar with casual forms of Japanese. As the manga takes place both at Kazumi’s home and workplace, you get to learn more about the contrast in how Japanese is spoken in the office and when at home with family. The best way to get a feel for the manga is to try reading a sample. 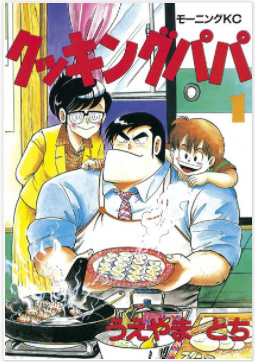 Fortunately, a lot of manga including Cooking Papa is available digitally.